No fat, no bones, just flavor! Try to find a pork tenderloin that weighs 1 1/2 pounds. When I am trimming the pork I like to cut off the uneven ends so that I wind up with a rectangle of meat like a rack of ribs. I always save the portion that is trimmed off the ends for stir-fry. The final result is about 1 pound to grill and 1/2 pound for stir-fry. 1. It is best to trim off the ends of the pork tenderloin to square it up. Reserve the trimmed off ends for another use. Butterfly the remaining tenderloin lengthwise, starting on one long side and cutting to within 3/4 inch of the other side. Open the tenderloin like a book. 2. Drizzle the oil evenly over both sides of the meat and rub it in, then sprinkle the Rib Rub evenly over both sides of the meat and pat it into all the surfaces. 3. Close the “book” and wrap it securely in plastic wrap. 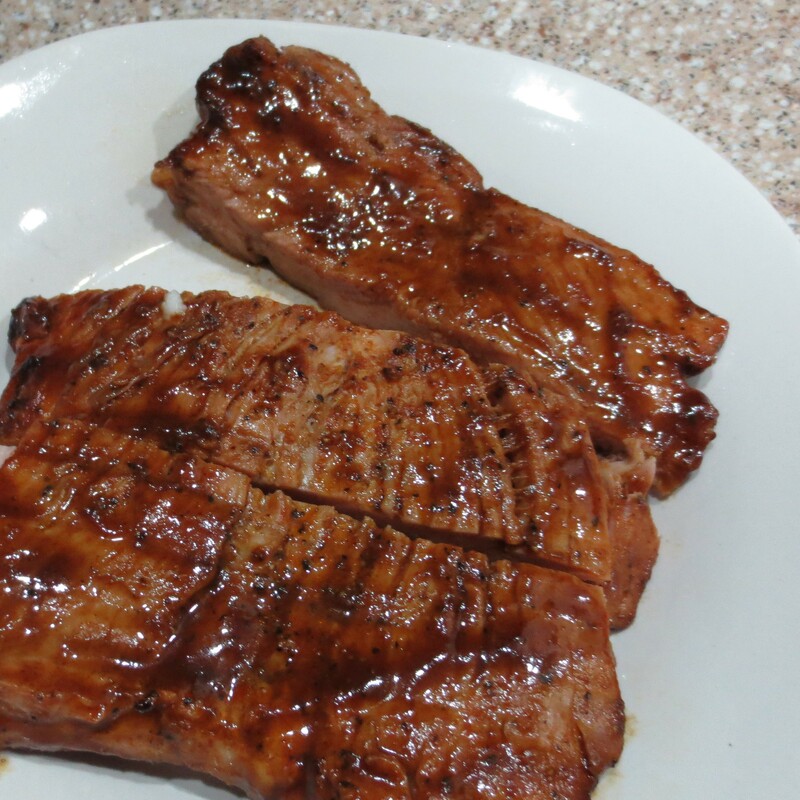 Place the pork on a plate and refrigerate for several hours or over night. 4. Remove the tenderloin and the Rib Sauce from the refrigerator 30 minutes before grilling. Meanwhile, build a two-stage charcoal fire with one hot side and one with no coals. 5. Over the hot side of the grill, sear the opened tenderloin flat side down for 5 minutes, covered, then brush liberally with Rib Sauce. Flip the meat and sear for another 5 minutes, covered, on the hot side as well. Again brush liberally with Rib Sauce, then turn onto the indirect heat of the cool side of the grill. Grill covered for another 15 minutes, turning and basting every 5 minutes, until cooked through. 6. Remove the tenderloin to a plate and cover with foil. Let stand 5 to 10 minutes, then slice crosswise into rib sized portions.